But four years earlier, in 1969, NASA astronauts on the Apollo 10 space mission heard what sounded like outer-space music -- from the dark side of the moon. And nearly 50 years later, those mysterious noises on Apollo 10 have become a trending topic on social media. In May of 1969, the Apollo 10 crew approached the far side of the moon. The three astronauts, Thomas Stafford, John Young, and Eugene Cernan, would have no contact with the Earth. But just as they approached the far side of the moon, the crew heard strange "music." "That music even sounds outer-spacey, doesn't it? Do you hear that, that whistling sound?" 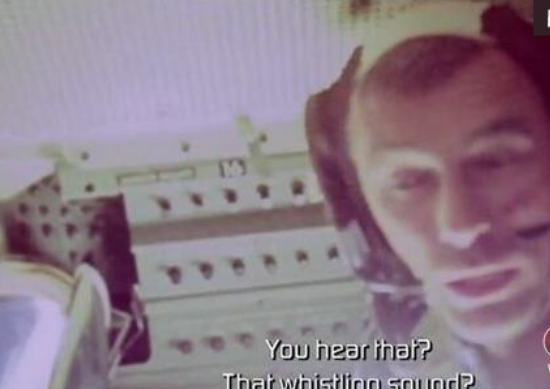 That was the conversation between astronauts Eugene Cernan and John Young after hearing the strange sounds. The story of the unusual space noises will appear on a television series called NASA's Unexplained Files. A preview of the episode appeared on YouTube earlier this week. Some news reports and social media posts have wrongly said that the Apollo 10 audio files were recently ‘declassified' -- or made public. But the audio files have actually been publicly available at the National Archives since 1973 -- the same year that Pink Floyd released its hit album. It looks as if she had just come back from outer space. Frustration predisposes him to look on the dark side of things. 1.The three astronauts, Thomas Stafford, John Young, and Eugene Cernan, would have no contact with the Earth. He tried in vain to get into contact with the local branch. Behind my back he has established contact with the enemy. 2.Some news reports and social media posts wrongly said that the Apollo 10 audio files were recently ‘declassified' -- or made public. The panel's initial findings have now been made public.